Helmut Kohl, Architect Of Germany's Reunification, Dies At 87 : The Two-Way The longtime German chancellor, who led West Germany and later a unified country, died Friday. 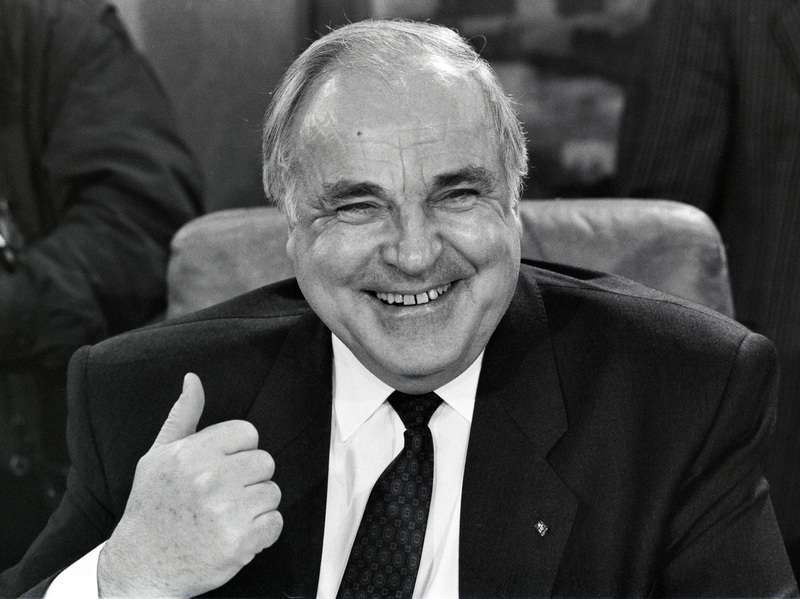 Kohl helmed two vast integration projects: Germany's reunification and efforts to forge a European Union. Former German Chancellor Helmut Kohl, who for more than a decade and a half helmed a country through historic upheaval, died Friday at age 87. The German leader's political party, the Christian Democratic Union, confirmed Kohl's death on Twitter. "We are in sorrow," the party tweeted. In a statement, former U.S. President George H.W. Bush mourned the death of his colleague and close ally, who first led West Germany and then oversaw its reunification with Communist East Germany. "Working closely with my very good friend to help achieve a peaceful end to the Cold War and the unification of Germany within NATO will remain one of the great joys of my life," Bush said in a statement Friday. "Throughout our endeavors, Helmut was a rock — both steady and strong." Understated and often underestimated, Kohl took power in West Germany in 1982. He was "a Gerald Ford figure, an undeniably decent man ... who had never been expected to make it to the top job," The New York Times reported at the time. Still, he quickly went to work cultivating the confidence of allies both personal and on the world stage, projecting an unassuming personality all the while. "For 70 percent of the time that he was in office he looked like he was semi-asleep," John Kornblum, U.S. ambassador to Germany during Kohl's final years in power, told NPR's Eric Westervelt. "He wasn't one of these people out ordering people around. He spent much more time talking with people on the phone and getting a feel for what was going on. He schmoozed all the time." Kornblum added: "But when it came time to do something, he did something." And no time demanded action of Kohl more than the tumultuous months around the fall of the Berlin Wall in 1989. For decades a barrier between the democratic and communist halves of the erstwhile German state, the wall brought much of those divisions down with it. As East Germans poured into the West — seeking an escape from a land where hundreds of thousands of Soviet troops were still stationed — the center-right politician quickly angled for a solution. Within weeks of the wall's fall, Kohl surprised European allies and even some members of his own cabinet with a speech laying out a 10-point plan for reunification. The plan to make Germany whole again, a prospect that alarmed British and French leaders with lingering memories of Nazi Germany, nevertheless eventually earned the support of the U.S. and the Soviet Union. "I know Washington was quite surprised by them. I'm sure, I know everybody was," Kornblum says. "He seemed to understand instinctively that unless someone took the lead and put it together, it was going to be chaos. And that Germany's interests were going to suffer." By October 1990, Germany was once more — for the first time since World War II — a single country. And Kohl was its chancellor. Kohl would continue to steer the newly unified Germany for much of the 1990s, helping to assure its place at the heart of another vast project of integration: the European Union. Kohl worked with other leaders on the continent to pull together the Treaty on European Union, which helped pave the way for the international organization of today. Yet by the end of his time in office, Kohl had begun to fall out of favor with the German electorate. Voted out of office in 1998, Kohl soon found himself in legal trouble. Investigators uncovered what they called illegal money deposited in his party's coffers with Kohl's knowledge. The probe would carry on for several years, until it was finally dropped with Kohl's promise to pay hefty fines. The Times notes that Kohl left Parliament the year after paying these fines. Germany's longest-serving chancellor since World War II lived long enough to see the European unity he championed see difficult times after he left office. The U.K.'s vote to leave the European Union, the Eurozone debt crisis and a resurgence of right-wing populism have all shaken European cohesion in recent years. In comments Friday, current German Chancellor Angela Merkel — Kohl's one-time protege and later political adversary — gestured toward these challenges, saying Kohl's memory offers a crucial guide. "This man who was great in every sense of the word — his achievement, his role as a statesman in Germany at its historical moment — it's going to take a while until we can truly assess what we have lost in his passing," Merkel said at a news conference, according to a translation by German publication Deutsche Welle. "Helmut Kohl was an important German, and an important European."